We provide qualitative Copper Slag Blasting service which is normally applied on ships, bridges, tanks, rail cars and water towers. 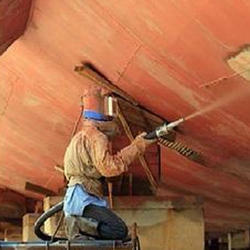 The blasting is mainly used to remove thick, tough heavy dust, rust and paints from heavy machines and tanks. We are highly acknowledged organization engaged in providing Copper Slag Blasting Service. Copper slag abrasive is suitable for blast cleaning of steel and stone/concrete surfaces, removal of mill scale, rust, old paint, dirt etc. Suitable for SA-3, SA-2½ and SA-2. This Copper Slag Blasting Service is used in the industrial belts to clean or smoothen any uneven surface like large-scale metals. Owing to the efforts of our skilled professionals, we have been constantly engaged in offering a qualitative assortment of Copper Slag Blasting Service. Owing to the wide experience in this domain, we are instrumental in providing Copper Slag Blasting Service. Backed by the skilled professionals, we are involved in providing Copper Slag Blasting Services. We are the leading organization in the industry to provide our clients the best quality Copper Slag Blasting Service. 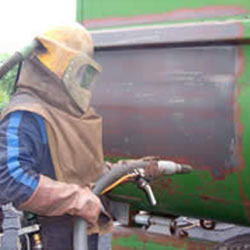 We, Shree Bissa Engineering having 10+ years experience in Sand blasting / copper slag blasting services in India. Our company is highly esteemed in offering Copper Slag Sandblasting. To meet the various requirements of the customers, we are involved in providing Copper Slag Blasting Services. Backed by our skilled professionals, we are involved in providing Copper Slag Grit Blasting Service. We are providing Copper Slag Blasting Service to our prestigious clients. It is used in the industrial belts to clean or smoothen any uneven surface.